Compost is a gardeners’ dream. Black and loamy it sifts gently and easily through the fingers yet with enough time–can turn even the most unworkable soil into perfection. Watching the rock hard clay of Northern Virginia turn into workable soil that breaks apart and allows water to drain makes me break into my “happy dance.” In addition, good compost provides almost every conceivable nutrient/mineral that plants need to thrive; and, that will eventually be transferred to us when they grace our plates. Chemical/artificial fertilizers are often devoid of the trace minerals plants need and do nothing to improve the soil. They are also are derived primarily from nonrenewable sources including fossil fuels which are bad for the planet. This is compounded by the fact that chemical fertilizers tend to “run off” quickly and easily which necessitates multiple applications. Finally, over time these repeat applications can create a buildup of toxic substances in the soil such as arsenic, cadmium, and uranium that get taken into the plants/fruits/vegetables we are growing. I am not a fan of ingesting these substances. Yuck! Especially when there is a natural alternative that strengthens the soil, our plants, and our bodies without poisoning the planet or our health. Yet the price for this almost miraculous substance was primarily the “hassle” of making it or a high financial price tag. Traditionally compost required an outside bin that one had to trudge the kitchen’s refuse to and often this task was required in less than desirable weather. I hate going through the rain to empty the compost pail. Compost making is usually not the most “attractive” addition to the yard so care had to be taken in placement for visual as well as the.. “ahem” . .scent considerations. You would have to monitor the heat, moisture, and commit to frequent “turning” of the mix to speed the breakdown of organic matter into usable compost AND this process took a fair amount of time to succeed. Finally, compost making was sadly limited primarily to summer months when the heat was high enough to make faster work of decomposition. 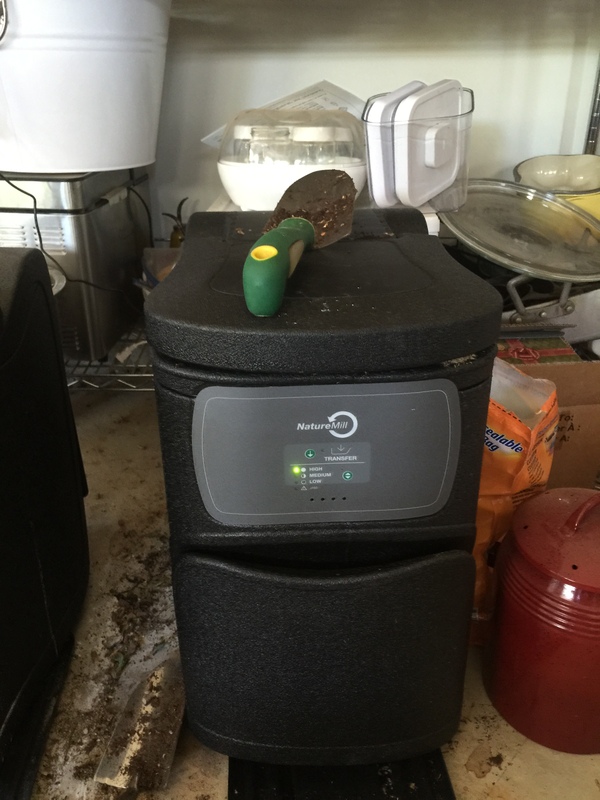 The concept works by use of an electric composter made by NatureMill (click here for a vendor) that is small and relatively neat. I say relatively because the majority of the material–whether organic leftovers I am adding or resulting compost–stays firmly within the machine. 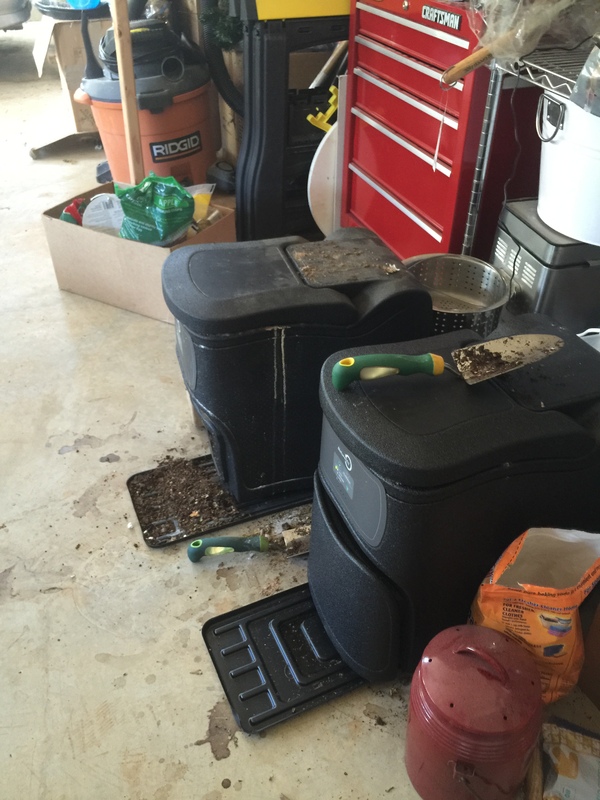 However, any time you are adding waste or transferring compost a small mess can result. For this reason I have placed the machines in our garage and will periodically clean up around them. The pictures I am posting are of my machines with the mess of almost a year of really minimal spot clean ups. You can add almost any scraps from the kitchen. There are the obvious fruit and veggie scraps, banana peels, coffee grounds, loose leaf tea leaves (not bags), egg shells, etc. But you can also add meat, chicken, fish bones, shrimp shells and tails. I haven’t added much of these though because I have had so much of the former. Now that I have two machines I will try more items. The few items that are “off limits” are fibrous items like corn husks or flower stems, or hard items like corn cobs, steak bones, pits, wine corks, walnut shells, because they can clog the machine. Also, paper items are off limits because of unsafe chemicals; and, any artificial items like plastic, metal, compostable plates. You can fill the machine anytime you choose but I like to do so once a day just to keep my compost pail from getting too full. 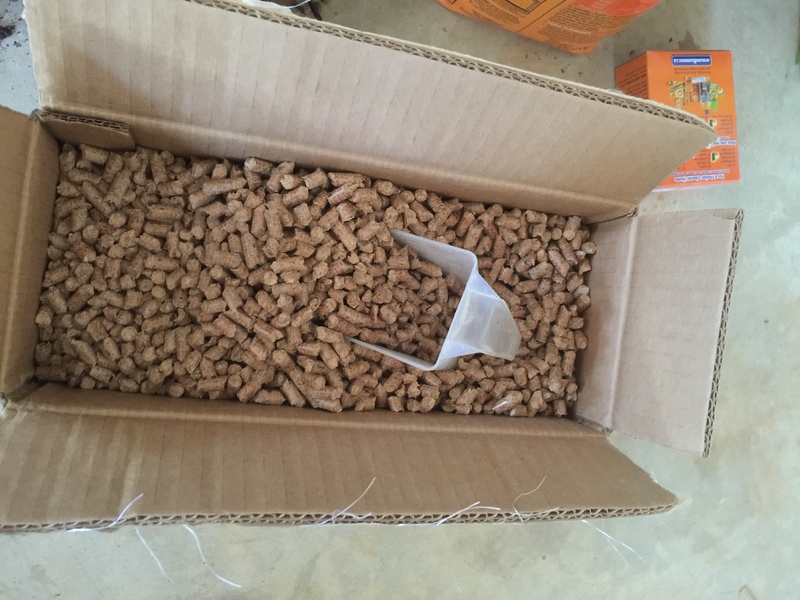 When you add into the machine you also add a tablespoon or so of baking soda and a cup of dried sawdust pellets. These are easily and cheaply purchased if you don’t have access to them locally. (Click here for a source). Because the machine is electric, it will maintain very high temperatures inside the unit (it doesn’t get hot around or outside the unit though I still wouldn’t place it against anything flammable); and, it has a metal “crank” that will automatically turn to stir the organic additions. That’s all you need to do. In about a week you can hit a transfer button and the machine will empty beautiful compost into a removable container where the temperature is still kept very high for additional decomposition. You can leave the compost there to have this extra “heat” treatment or dump it wherever you are storing your compost till needed. I store mine in a wheelbarrow in my garage. It is best to wait a few days before application after it’s removed from the machine to “cure” it; but, I have used it immediately with no harm. It is easy to take it around the garden and shovel out where needed this way. 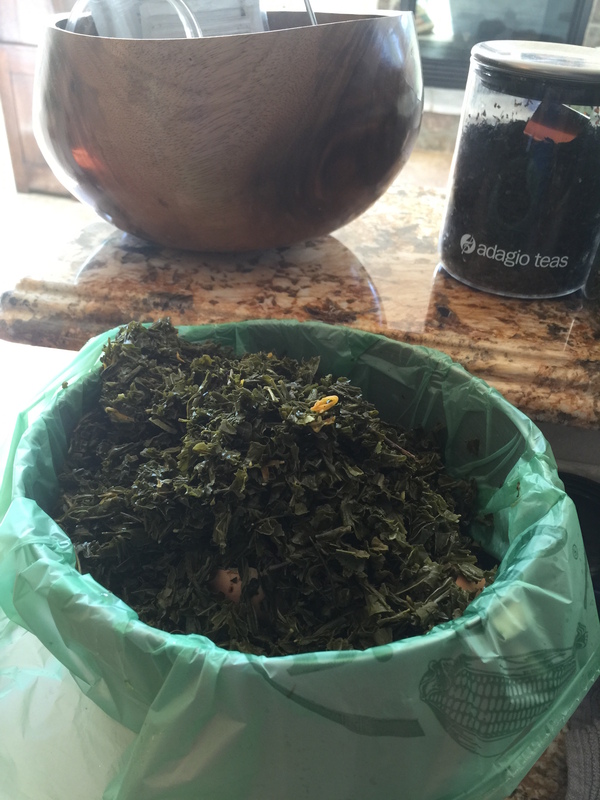 This compost is very potent and a little goes a very long way. A shovel full or two around a tree is a lot of nutritional boost. Generally there is very little “aroma” and the machine’s presence rarely produces a scent that we would be offended by. There can be an “earthy” scent when you are right on top of the machine but it isn’t unpleasant and it isn’t detectable even a few feet away. However, if you put brassica plants such as broccoli, cauliflower, kale, brussels sprouts, mustard greens, or cabbage there WILL be a very noticeable smell. I did this once and only once. That time the smell was so powerful it could be detected in the house and my family almost ended my composting experiment. If you have a lot of these I recommend using the machine outside. It is safe to use outside as long as the plug is protected from the elements. 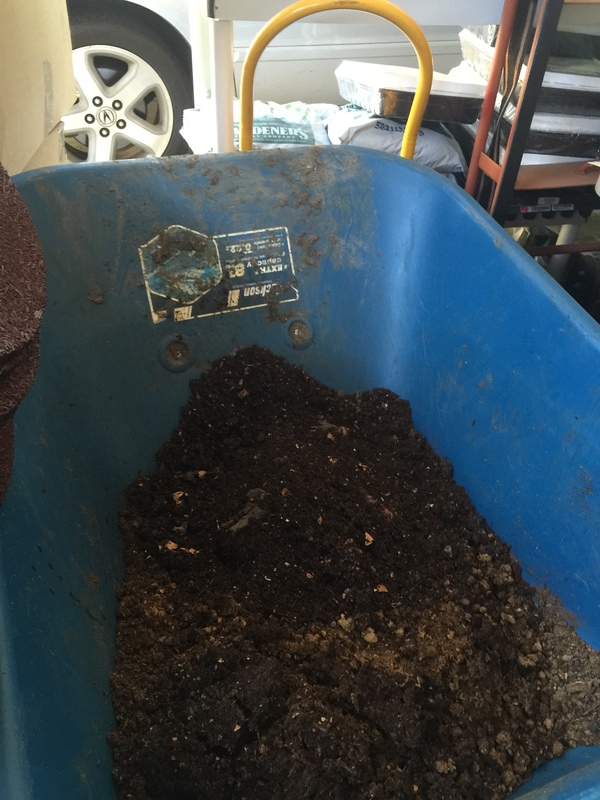 Beginning to make and use our own compost was one of the best things I could have started for my gardens health. I have watched the soil improve more than I thought possible, my plants are growing stronger and producing more, and I seem to have less insect problems (which I attribute to stronger plants). I also take comfort in knowing that the source of my garden’s strength is not also depleting and poisoning the earth I am relying upon. What really surprised me though–besides that this method actually worked–was exactly how much of our families “waste” could be recycled back into the earth rather than being simply thrown away. It may seem silly; but, I feel excited now every time my son’s banana peels or our omelet shells or any of the other myriad of “trash” goes into the compost pail. I know its going into our garden, our food and back into our bodies; and, that is a beautiful thought. Happy gardening!!! ← Simple Chilled Avocado Soup–health powerhouse, delicious, and elegant to serve. Sounds like a fun gizmo. I’m lazy and simply throw my scraps in a pile outdoors, and this year I’ve been throwing the food scraps right on top of my beds. I don’t know if it’s as effective, but super easy and adds something to the soil. By the way, I’m curious where in No. VA you live. I grew up in McLean and my mom still lives there, and my brother’s in Arlington. Thanks. I live in Fayetteville, Arkansas now, but my family is in No. Va.
What a small world. I have family in Southern Missouri. About 3 miles from the Arkansas line. Have you ever heard of Thayer, MO? Fun. No, but I just looked it up. It’s about 3 hours away. That’s still close enough to count. 🙂 Glad to meet you!